XS Trash is a well-respected Broward Junk Pickup service. We are affordable and reliable. When you are doing in depth renovation on your home or business you need us. Whatever the project is, we've got you covered. Our dedicated staff will haul away your junk and clean the area. Our professional team of experts is ready to assist you. Call us today! For fast and efficient Broward Junk Pickup service you need XS Trash. We provide excellent service to our clients. Our company was built on a strong work ethic. For every project we are assigned we make sure that our clients feel they are our top priority. Our Broward Junk Pickup service is licensed, bonded, and insured. Our team can handle jobs big and small. We can pick up one item or truckloads. We work with residential and commercial properties. We will efficiently clear away all junk, and debris, left behind by your project. XS Trash has a flexible Broward Junk Pickup service. We do not require our clients to separate their junk into piles. We will take care of it. The best part is that we offer affordable rates and convenient scheduling so we can accommodate all clients. 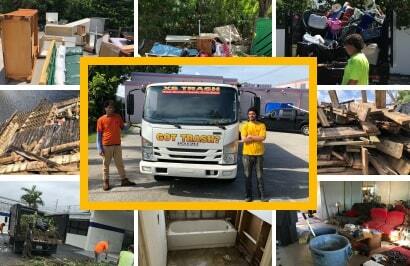 Licensed & Insured Broward Junk Pickup, Junk Pickup & Hauling.